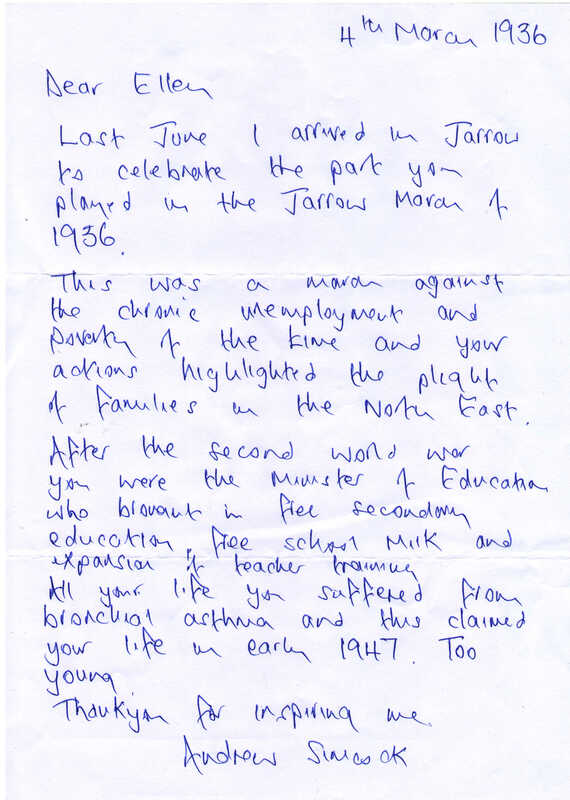 To Ellen Wilkinson, leader of the Jarrow march and UK Education Minister, 1945-47. From Andrew Simcock. Last June I arrived in Jarrow to celebrate the part you played in the Jarrow March of 1936. This was a march against the chronic unemployment and poverty of the time and your actions highlighted the plight of families in the North East. After the second world war you were the Minister of Education who brought in free secondary education, free school milk and expansion of teacher training. All your life you suffered from bronchial asthma and this claimed your life in early 1947. Too young. leader of the Jarrow march and UK Education Minister, 1945-47. Born 1891, died 1947. More information about Ellen Wilkinson.